A beloved football coach. A swimmer who had just won a college scholarship. A freshman soccer player. A geography teacher shot while trying to barricade the door. They are among the victims of a mass shooting at a Florida high school on Wednesday. Details of the 17 people who died are emerging. Aaron Feis, assistant American football coach at Marjory Stoneman Douglas High School in Parkland, is being hailed as a hero for shielding students from bullets. He was fatally injured after diving in front of a pupil. The MS Douglas Eagles, the school football team, confirmed Mr Feis' death on Twitter. "He died a hero," they wrote. "I coached with him. My two boys played for him," Broward County Sheriff Scott Israel said. "The kids in this community loved him, adored him." Students led tributes to their former coach as news of his injuries first spread. "He was a great guy," football player Gage Gaynor told local newspaper the Sun-Sentinel. "Everyone loved him. Shame he had to go like this. Always gave his all to making us better. Definitely learned a lot from him." Mr Feis also worked as a school security guard. He responded on walkie-talkies to chatter about the attack when it began, and was overheard saying "no, that is not firecrackers" as the gunshots rang out. Former student Andrew Hoffman, who also recently worked at the high school as a swimming coach, said Mr Feis was "very well dedicated" to safety at the school in his capacity as a security guard. He was married, with a baby daughter. 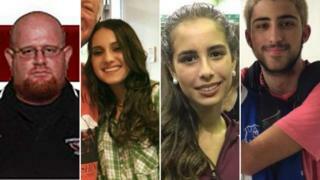 Fred and Jennifer Guttenberg were among those who took to social media to try to locate their missing children on Wednesday night. While their son Jesse was able to return home safely, their daughter Jaime, 14, was fatally injured. Her Facebook page has been turned into a memorial and her father has confirmed her death, thanking people for their messages of support. Friends remember Jaime as a talented dancer with a mischievous sense of humour. "Dance in Heaven, beautiful girl," wrote Michelle McGrath Gerlick. This photograph of Alyssa Alhadeff and "pop pop" was widely shared on Facebook by her cousin, Melissa Dibble, who appealed for people to help find the missing teenager. She later confirmed on her Facebook page that the freshman soccer player had lost her life. Another cousin, Ariella Del Quaglio, said her "heart is broken" at the loss. Parkland Soccer Club urged Alyssa's teammates to honour her memory by striving for greatness in their future lives. Nicholas Dworet was confirmed dead by his swim team on Facebook, who posted: "It's with a heavy heart that I/We have to announce that our family member, teammate, TS Aquatics swimmer Nick Dworet has passed away." The 17-year-old had secured a swimming scholarship to the University of Indianapolis just a week ago. His partner Daria Chiarella changed her Facebook profile picture to a selfie Nicholas took, prompting an outpouring of support. "I'm so sorry, we all love you so much and are here if you need anything," read one comment. Martin Duque, aged 14, was confirmed dead by his brother Miguel Duque, who posted this photo of them together on Instagram. "Words can not describe my pain," he wrote. "I know you're in a better place." Chris Hixon, 49, was the athletic director at Stoneman Douglas and was reported dead by local media. As well as being a wrestling coach, he led the school's baseball team to state and national championships in 2016. He had two children of his own. A photo was later shared of Mr Hixon at his US Navy retirement ceremony with his son, Thomas Hixon. Geography teacher Scott Beigel, 35, let students into his classroom to shelter and was shot dead by the gunman while trying to lock the door, a student told Good Morning America. His friend Matt Hipps took to Facebook to share his memories of Mr Beigel, calling him: "My friend, my brother, my family." "He was so unselfish with his talents and gifts," he wrote. "He made others better." "He made the ultimate sacrifice," said Mr Hipps. "I won't say goodbye. It just hurts too much. I will see you on the other side." Mr Beigel also worked at a summer camp in Starlight, Pennsylvania. Libby James Watt, a former colleague there, told the BBC: "We met in Summer 2016. The whole Camp Starlight family is broken. "He was the most quirky humoured character with a fierce heart to craft strong and caring people. His passion was undeniable and infectious - he'd light up a room, he'd light up an entire state. "Our Camp family has lost an icon, but for protecting his students - true to his heart to the end. A leader and protector." Meadow Pollack was a senior at the high school. Her father confirmed to local media that she had died. A family friend had previously posted on Facebook looking for information, and the teenager's Facebook page has been changed into a memorial. Her friend Gii Lovito took to Facebook to share her thoughts. Cara Loughran was confirmed dead by a family friend who wrote on Facebook: "Cara's parents were given the news no parent ever wants to hear at 2am. "This is too horrible to even begin to process," she added. "Our next-door neighbour's daughter was one of the lives taken too soon by a senseless act," Danny Vogel posted on social media. This photo of Gina Montalto was widely shared on social media by her neighbour Michael Citron. Her death was later confirmed as her mother changed her Facebook profile picture to waves crashing against rocks. Gina, 14, was part of the school's Color Guard - a team of flag-bearers and dancers that accompanies the marching band. The squad were due to compete in Tampa this weekend. Her former instructor Manny Miranda wrote on Wednesday night: "My heart is broken into pieces. I will forever remember you my sweet angel." Joaquin Oliver was set to graduate in a few months' time. He was confirmed dead by a Venezuelan journalist, who was with his family when they received the news. His most recent photo on his Instagram page, with girlfriend Victoria Gonzalez, has seen an outpouring of support. This includes comments from friends and strangers alike, many of whom simply wrote 'que en paz descances' - Spanish for 'rest in peace'. The 14-year-old was confirmed dead by her aunt on Facebook. "There are no hashtags for moments like this, only sadness," wrote Claudette McMahon Joshi, as she asked friends online to pray for her niece. A local Mormon church leader confirmed in an email to his congregation that the teenager was confirmed dead at 0100e on Thursday. "She was a valiant young member of the Coral Springs Ward," wrote Stephen Thompson. The 14-year-old played trombone in the school marching band and was proud to have helped lead the squad to a state championship last year. His father, Max Schachter, said he will be remembered as "a sweetheart of a kid". Alex "just wanted to do well and make his parents happy," his father said, adding that he has a brother who also attends the school but was not injured. Schentrup was a 2017 National Merit Scholar semi-finalist, according to the Broward County Public School system. The 16-year-old's death was reported by several friends and family members on social media. Her cousin, Matt Brandow, called her "the smartest and most intelligible 16 year old I've ever met". "You will be remembered forever," he added. The 15-year-old's aunt wrote on Facebook that the teenager had been discovered on the third floor of the school. "This has devastated our family and we're all in shock and disbelief. Our hearts are broken," Toni Stroud Brownlee wrote in her post. Softly-spoken Helena, 17, was a "smart, kind-hearted, and thoughtful person," according to tributes. "She was deeply loved and loved others even more so. Though she was somewhat reserved, she had a relentless motivation towards her academic studies, and her soft, warm demeanour brought the best out in all who knew her," said Curtis Page Jr., who described himself as a relative. Her cousin Fena Cooper had shared a news article calling for blood donations on Facebook on Wednesday, adding that her family "still have no update on the location of my cousin". "Please continue to remember my Aunt Anne Ramsay, my cousin Ellis Ramsay, and their father Vincent Ramsay, who lost his only daughter on his birthday." Peter's cousin Aaron Chen told First Coast News the 15-year-old spent his last moments trying to save lives. He was in the Junior Reserve Officers' Training Corps (JROTC), a school programme for potential US military officers. Aaron said Peter was last seen in his JROTC uniform, holding a door open so others could flee. Jesse Pan, a neighbour and longstanding friend of Peter's family, told the BBC Chinese Service he had tried to support the teenager's parents. "I was there with his parents, helping translating and finding a funeral home," he said. "His parents fainted as soon as they saw his body. He had got multiple shots in front… So horrible." Friend Jordan Moll told the BBC Peter was a "kind and caring" person, saying: "It was great spending the time I had with him. His family always treated my friends and I well when we visited. Even though they don't speak English, they were always happy when we came over. I'm very grateful that I met Peter, and he will be remembered."